Modi added that films made on social subjects took such issues to the masses in a subtle manner and contributed to nation-building. Underlining the diversity of films, he said that Indian cinema was a true reflection of 'Ek Bharat Shreshtha Bharat'. 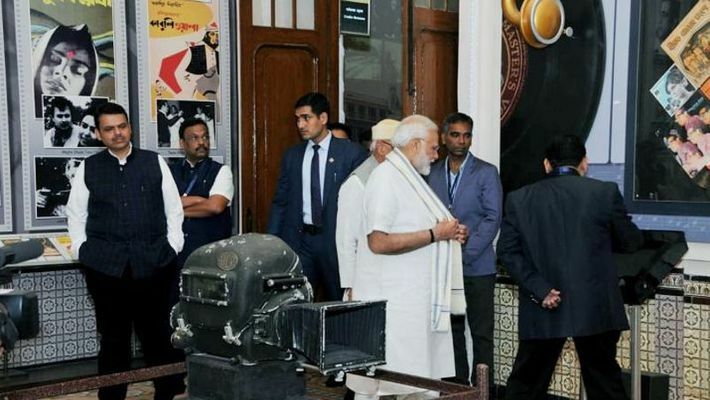 Mumbai: Prime Minister Narendra Modi on Saturday inaugurated the National Museum of Indian Cinema here and underlined the role Indian films have played in projecting the nation’s soft power across the globe. Modi heaped praise on the artistes for taking Indian cinema to the level that it has currently reached. Citing Raj Kapoor, whose movies have been appreciated the world over, the Prime Minister highlighted the role of films in strengthening ‘Brand India’. The Prime Minister shared his experiences of interaction with world leaders to reiterate the impact Indian cinema has had. He talked about the Prime Minister of Israel knowing the song 'Ichak Dana' by heart without knowing the language and about school kids performing in South Korea on the song 'Haathi Mere Saathi'. Modi spoke about the niche carved out by Indian TV serials. “There is hardly any family in Afghanistan which has not heard about Kyunki Saas Bhi Kabhi Bahu Thi,” he said. He also mentioned the love that the Vietnamese Prime Minister’s wife had for the TV serial Ramayan. “All these factors have played an important role in the projection of India’s soft power across the globe,” he added. Applauding the silent power of cinema in facilitating new thoughts and ideas, Modi spoke about recent films on a variety of social subjects, like toilets, women empowerment, sports, disease awareness and so on, which have also been commercially successful. He added that films made on social subjects took such issues to the masses in a subtle manner and contributed to nation-building. Underlining the diversity of films, he said that Indian cinema was a true reflection of 'Ek Bharat Shreshtha Bharat'. The Prime Minister said that the film industry had an enormous role in promoting tourism, which has the added benefit of employment generation. Modi spoke about the nearly 30-hour footage available in Gulshan Mahal about the bravery and sacrifice of lakhs of Indian soldiers martyred in the Second World War. Congratulating the films division for digitising this footage, Modi said it would serve as an inspiration for the younger generations. Talking about films and society being reflections of each other, the Prime Minister cited examples of patriotic movies starring Manoj Kumar, the angry young man portrayal on the silver screen, the hopes and aspirations of society being projected and the recent coming up of ‘heroes’ from not just metropolitan cities but also Tier-2 and Tier-3 cities and rural areas. Modi said that the government needed sabka saath (everyone's cooperation) in order to ensure sabka vikas (everyone's development), and urged the film fraternity to contribute to nation-building and take the extraordinary heritage of Indian cinema to the world. Speaking on the occasion, Union minister of state (independent charge) for information and broadcasting and youth affairs and sports, Rajyavardhan Singh Rathore highlighted the steps taken by the government to promote Indian cinema. In his welcome address, Shyam Benegal, head of Museum Advisory Committee, NMIC, said that Indian cinema was as old as cinema itself — the very first Indian film was made only three years after the invention of cinema. “Indian cinema is the only cinema which has its own specific form, which is different from cinema in other parts of the world, a form which suits us perfectly — it has tragedy, comedy, melodrama, dance — in short, everything,” he said. It is housed in two buildings — the new museum building and the 19th-century historic palace Gulshan Mahal — in the films division campus in Mumbai. 1. Gandhi and cinema: It not only depicts the movies made on the life of Mahatma Gandhi but also showcases the deep impact his life had on cinema. 2. Children’s film studio: It gives visitors, particularly children, an opportunity to explore the science, technology, and art behind filmmaking. It offers hands-on experience on various facets associated with making cinema like camera, light, shooting, the experience of acting, and so on — presented in an interactive format. The exhibits displayed include chroma studio, immersive experience zone, stop-motion animation studio and virtual makeover studio among others. 3. Technology, creativity and Indian cinema: It showcases the creative use of technology by Indian filmmakers over the years to produce a cinematographic impact on the silver screen. 4. Cinema across India: It showcases the kaleidoscopic presence of the vibrant cinematographic culture across India. B. Gulshan Mahal is an ASI grade-2 geritage structure which has been restored as part of the NMIC project. The displays present here showcase the journey of over 100 years of Indian cinema. It is divided into nine sections: The Origin of Cinema, Cinema Comes to India, Indian Silent Film, Advent of Sound, The Studio Era, The Impact of World War II, Creative Resonance, New Wave and Beyond and Regional Cinema. Is India secretly readying for action to avenge Pulwama massacre?